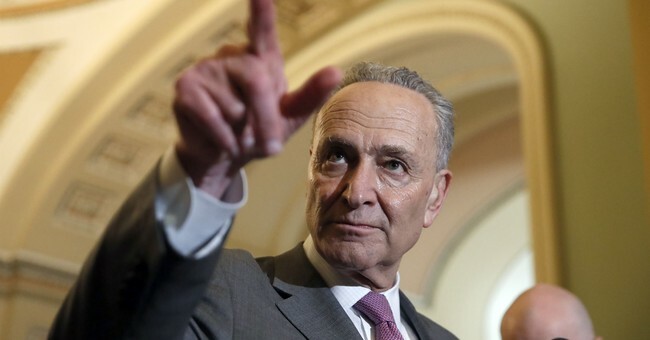 Senate Democratic Leader Charles Schumer (N.Y.) on Tuesday dismissed a legislative proposal backed by Republican leaders to keep immigrant families together at the border, arguing that President Trump could fix the problem more easily with a flick of his pen. “There are so many obstacles to legislation and when the president can do it with his own pen, it makes no sense,” Schumer told reporters. “Legislation is not the way to go here when it’s so easy for the president to sign it.” Asked if that meant Democrats would not support a bill backed by Senate Majority Leader Mitch McConnell (R-Ky.) to keep immigrant families together while seeking asylum on the U.S. border, Schumer said they want to keep the focus on Trump...Democrats want to keep the pressure on Trump instead of having Congress assume responsibility for the growing crisis. Schumer’s position immediately raised speculation over how long Democrats would stick to their position if Trump refuses to change his mind. "Let's hope we never get to that," ...Schumer said. 1) You punted on imm reform when you helped lead the majority. 2) Yes, Trump should rescind the policy, but that’d default to a still-broken status quo. 3) Your branch’s job is to legislate. Point by point: (1) Democrats have gotten a lot of political mileage out of fulminating on guns and immigration, each of which they conspicuously avoided when they held large Senate majorities. The party's second-in-command and senior strategist during that time was none other than Chuck Schumer. (2) I'll circle back to this one. (3) Democrats and liberals spent quite a lot of time in recent days angrily screaming about Republicans' supposed 'refusal' to act to stop President Trump's zero tolerance policy. Words aren't enough, they seethed; how dare you celebrate Father's Day while doing nothing to prevent babies from being ripped away from their fathers? Many of these attacks were unhinged and unfair to begin with, but they look even more like bad-faith demagoguery in light of the same objectors' immediate rejection of...concrete Republican action to stop family separation. Such efforts are now denounced as "hostage taking" and "ransom seeking" because some of the proposals include provisions on other immigration-related matters (I believe a more holistic approach to various challenges should have a better chance of passing, but Washington's dysfunction feels pretty hopeless at the moment). But a number of the Republican plans are stand-alone, "clean" bills, including Ted Cruz's generally good idea (which needs amending), and a forthcoming offer from Senate GOP leadership. Mitch McConnell has said that every member of his conference supports legislation to end and fix family separation and its root causes. Which raises the question: (4) Will Chuck Schumer attempt to filibuster any or all of these bills? He should be pressed on this point, as should his members. I'd bet they lack the numbers and the will to sustain such a mind-bogglingly obstinate maneuver, especially on the stand-alones. If whatever might pass the House cannot get to 50 votes in the Senate (I'll reiterate that an amended House compromise bill seems totally reasonable to me), the upper chamber should pass (perhaps pre-emptively) one of their own bills, then kick it down to the House, where I'd be willing to bet a clear bipartisan majority of members would be on board (UPDATE II: It looks like a narrowly-tailored family separation bill will emerge from the House this week, with the president's support). Under catch-and-release, if someone made it to the border and claimed asylum (whether true or not, and most of the time it wasn’t true), they were released into the U.S. until a future hearing date. Many folks obviously don’t show up at these hearings, so this became a new pathway into the U.S. Catch-and-release – combined with inefficient deportation and other ineffective policies – created a magnet whereby lots of people came to the border who were not actually asylum-seekers. This magnet not only attracted illegal immigrants generally, but also produced an uptick in human trafficking across our border. Let's "protect our borders," but let's "close ICE down"? That's radical, incoherent stuff. And to Hayes' point, even if you grant that the large majority of illegal immigrants don't pose a security risk, what about those who do? There isn't a magic system for discerning who's a danger and who's not. And isn't there an inherent national sovereignty reason to detain illegal border crossers? If we don't, we don't really have a border. Would that outcome be welcome? Parting thought: The current crisis, and the unaccompanied minors crisis, and the DREAMer issue were all caused by, or heavily linked to, insufficient border security. How on earth is enhanced border security considered a "poison pill" or "ransom demand" as we fashion new laws? Unless, as I say, continued illegal immigration is seen as an acceptable, or even desirable, result by a growing faction of the Left. It seems like more and more people are willing to say as much out loud. Every Democratic official and candidate should be asked whether they agree -- and if not, what they're prepared to do to actually prove it. NEW: Speaker Ryan says House will vote tomorrow on legislation keeping families apprehended at the U.S.-Mexico border together throughout their legal proceedings. That the admin rolled out its 0 tolerance policy *w/o* these measures in place (which Trump may now temporarily implement via exec order) = political & moral malpractice. "Deterrence" gambit failed badly in every way. Its architects' judgment should be evaluated accordingly.